Music is an important part of our mix at Jewish Humor Central. In our sporadic series bringing new musical groups to your attention, we're introducing you to the Ramatayim Men's Choir of Jerusalem. Late in 1995, four enthusiasts gathered in the Ramot suburb of Jerusalem, to sing choral music they recalled from synagogue services in their youth. Since then the choir has grown to 40 choristers, native Israelis and Olim from 4 continents who share a love of the great tradition of Jewish liturgical music and of singing together. 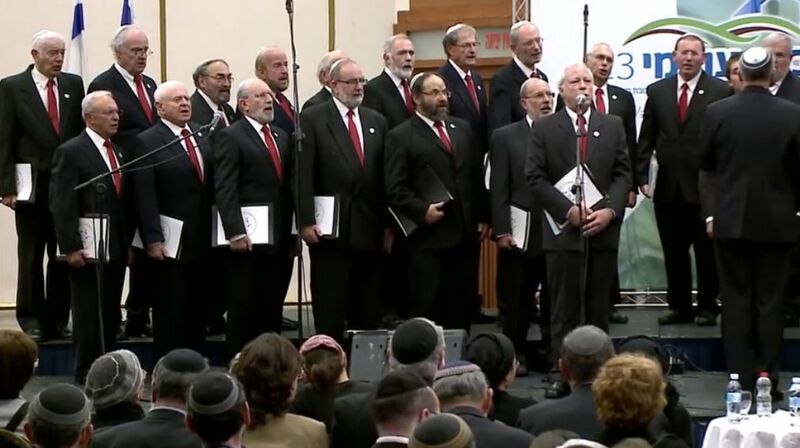 The choir appears regularly at concert halls and synagogues throughout Israel. Their list of approximately 250 performances includes appearances alongside some of the finest cantors in the world as well as artists in different genres. They have appeared in concert with the Israel Symphionette Orchestra 'eers Sheva, on national television and radio and have also performed at the residence of the President of Israel. The choir's repertoire consists mainly of Jewish liturgical music and includes Chassidic and Israeli songs, pop, opera and folk music. All activities are performed on a voluntary basis. They perform regularly in support of various Israeli and Jewish charitable and social causes. A distinctive feature of the choir's activity is their active collaboration with ensembles of the same genre, inaugurating and hosting joint concerts in Jerusalem and Tel Aviv. The choir's name derives from Ramatayim-Tzofim, in the hill country of Ephraim, birthplace of Samuel the Prophet, mentioned in the Book of Samuel 1 (1:1) and associated with the suburb Ramot, Jerusalem. In this video they sing a medley of songs about Jerusalem at the International Rabbinical Conference in 2014. Enjoy, and Shabbat shalom ! Oei... I don't recognize anyone.